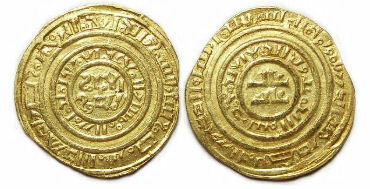 Crusaders gold Dinar, imitating a Fatamid gold Dinar of al-Amir. Second Phase, ca. AD 1148 to 1187. Denomination: Gold Dinar (or Bezant). Mint: The exact location of minting of this series is uncertain, but most likely it was the city of Acre. Date: This coin is from the 2rd phase in this series, thought to have been struck between about AD 1148 and 1187. Reference: Coinage in the Crusader States -page 116, #3 is the closest match. The prototype coin being imitated is a fatamid dinar of Al-Amir of Misr (Cairo), Album type 730. Size: 21.0 x 21.8 mm. Weight: 3.48 grams. Grade: aXF, with a fairly good strike. 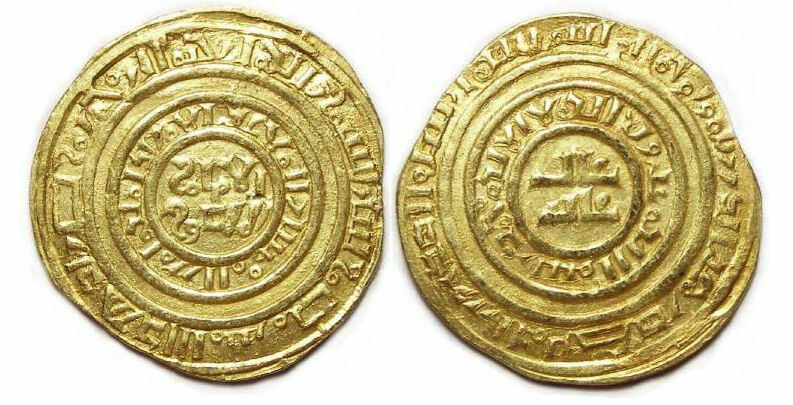 Obverse and Reverse: Pseudo Arabic inscriptions, but are in part well enough engraved to be legible. Crusaders at Antioch. Bohemund III, minority of AD 1149 to 1163. Silver Denier. Reference: Metcalf Crusader 348 class B. COINS OF THE CRUSADER STATES - page 205 to 206, #26 (square A and V, anulet). Size: 15.0 x 16.1 mm. Weight: 0.79 grams. 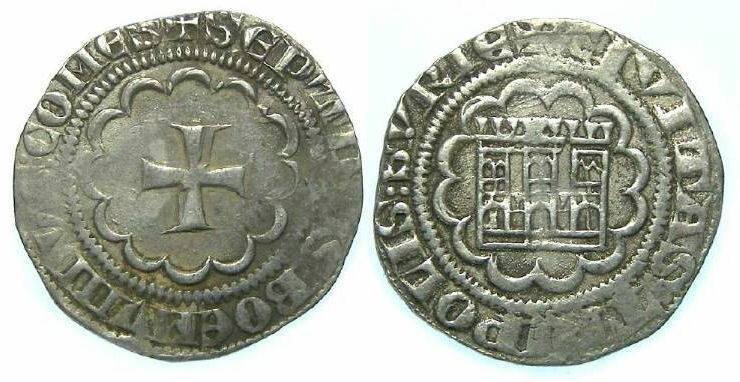 Obverse: Bare head of Bohemond III, with long hair, with BOHEMONDVS around. Reverse: Short cross with an anulet in the upper left, all within a circle, with ANTIOCHIA around. Crusader. Rhodes. Juan Fernandez of Heredia, AD 1376 to 1396, Silver Gigliato. Juan Fernadez of Herdia was the Grand Master of the Order of the Knighs Hospitallers of St. John of Jersualem, at Rhodes from AD 376 to 1396. While technically later than what is thought of as the Crusader period, most collectors include these coins in the crusader series (just as they do othe coins of the Kingdom of Cyprus right into the 16th century). Size: 28.4 x 28.7 mm. Weight: 3.93 grams. Reference: Met. 1214 to 16 variety., CCS 25g (page 526). Grade: VF with typical weakness and difficult to read inscriptions. Attractively tone. Obverse: Grand master kneeling beore a patriarchal cross on steps, with a castle behind and an "G" below the castle. In it's ideal form the inscription around would read, starting at the initial cross at 12 o'clock, FR IOANES FERDINANDI DEI GRA M, but the inscription on this coin is a variation on that, with some different abreviations, some letters llgate, and because of some weak areas I cannot quit work it out exactly. Reverse: Cross fleury, and in it's ideal form the inscription around would read OSPITALIS IOHIS IRL'NI 9T RODI, but it a number of the letters appear to be ligate or completely on top of one another, making the exact wording hard to work out. AD 1275-1287. Silver half Gros. Date: AD 1275 to 1287. Reference: Coinage in the Crusader States -Tripoli #27. Size: 18.7 x 19.5 mm. Weight: 2.12 grams. Grade: VF with some weak areas. 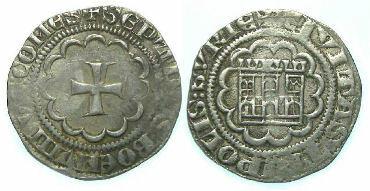 Obverse: Cross in a circle of twelve arches, with SEPTIMVS BOEMVNDVS COMES around. Reverse: Triple towered two story gateway, in a circle of twelve arches, with CIVITAS TRIPOLIS SVRIE around. Armenia was a medieval Christian Kingdom located near the borders of Turkey, Syria and Iran, a region normally associated with Islam. The coins have distinctly Christian images, often the king on horseback, holding a cross. The legends are of a distinctive Armenian script that is still in use today, but some examples have bilingual Armenian-Arabic inscriptions, attesting to the close ties these people had with the local Islamic cultures. Copyright © 1997-2013 R & T Enterprises Ltd.